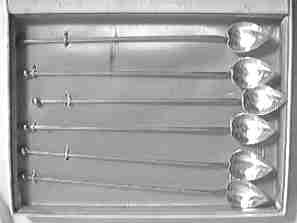 An interesting type of spoon variation is the "straw spoon". The spoon handle is a straw while the spoon bowl can be used to stir the drink. Spoon straws come in several different styles, and occasionally we will find a souvenir straw variation, but the styling does not really lend itself to this purpose. Most, however, are designed to be used rather than displayed. Sterling straws are a lot classier than the plastic ones which we currently use. "In the late 18th century, metal straws were used in Holland with brandy and punch bowls for all festive occasions. Gorham's new Sterling-Heart Straws add their own festive note to the serving of iced tea, iced coffee and lemonade or your favorite tall drink." Straw spoon with a detailed handworked repousse flower design. no marks. My first inclination would be to call this a Victorian style, but I am not sure if the Victorians used straw spoons of this type. I have seen some dealers call these spoons Persian. It is possible that they come from Persia (Iran).